A contract is a legally binding exchange of promises or agreement between parties. Contract law is based on the Latin phrase pacta sunt servanda (pacts must be kept). Breach of contract is recognized by the law and remedies can be provided. Almost everyone makes contracts every day. Sometimes written contracts are required, for example when buying a house. However, the vast majority of contracts can be and are made orally, like buying a law text book, or a coffee at a shop. Contract law can be classified, as is habitual in civil law systems, as part of a general law of obligations (along with tort, unjust enrichment, or restitution). As a contract is an agreement between two or more parties which is legally binding, it creates a form of partnership wherein an understanding is made in a harmonious, mutually fulfilling, and cooperative manner. In primitive societies, agreements were binding by means other than legal contracts, such as the use of property, which was before the art of script or writing. Yet, oral histories about possessions were not sufficient to efficiently record a transaction or many transactions. Thus, written contracts were needed as a recourse when promises were broken or the transaction did not turn out as expected. Within the dawn of script, and in the reign of Rim-Sin, King of the Larsa dynasty (Sumerian period) c. 2300 B.C.E., there is evidence of a written contract for the sale of a slave as well as in the 8th year of Nebuchadnezzar II, 597 B.C.E. where there is a tablet showing a contract for the sale of a slave. In Sumerian history in 2000 B.C.E., there is evidence of written contracts for the sale of real estate. Moreover, in 532 B.C.E., there is a written contract for the sale of a standing crop. s an index of the legal development from these far-away times, contract law is an exchange between parties wherein promises are kept in an equitable manner and are available to all parties to create a form of partnership. Terms: A set of clauses defining the exact set of promises agreed to. Mutual agreement: There must be an express or implied agreement. The essential requirement is that there be evidence that the parties had each from an objective perspective engaged in conduct manifesting their assent, and a contract will be formed when the parties have met such a requirement. (Notice that the objective manifestation requirement means that one need not actually assent had been granted.) For a contract based on offer and acceptance to be enforced, the terms must be capable of determination in a way that it is clear that the parties' assent was given to the same terms. The terms, like the manifestation of assent itself, are determined objectively. Consideration: There must be 'consideration' given by all the parties, meaning that every party is conferring a benefit on the other party or himself sustaining a recognizable detriment, which is a cost to a party, whatever it may be. Consideration need not be adequate, which means courts generally do not look to the value parties place on things contracted for, thus agreeing to buy a car for a penny may constitute a binding contract. Consideration must be legally sufficient, however. Legally sufficient consideration exists when a promise is made, which induces the other party to incur a detriment, which in turn reinforces the initial promise. This is called mutual conventional inducement, a phrase coined by Oliver Wendell Holmes Jr.. Competent, Adult (Sui Juris) Parties: Both parties must have the "capacity" to understand the terms of the contract they are entering into, and the consequences of the promises they make. For example, animals, minor children, and mentally disabled individuals do not have the capacity to form a contract, and any contracts with them will be considered void or voidable. Although corporations are technically legal fictions, they are considered corporate persons under the law, and thus fit to engage in contracts. For adults, most jurisdictions have statutes declaring that the capacity of parties to a contract is presumed, so that one resisting enforcement of a contract on grounds that a party lacked the capacity to be bound bears the burden of persuasion on the issue of capacity. Proper Subject Matter: The contract must have a lawful purpose. A contract to commit murder in exchange for money will not be enforced by the courts. It is void ab initio, meaning "from the beginning." Mutual Right to Remedy: Both parties must have an equal right to remedy upon breach of the terms by the other party. Mutual Obligation to Perform: Both parties must have some obligation to fulfill to the other. This can be distinct from consideration, which may be an initial inducement into the contract. Intention to create legal relationship: There is a strict presumption for commercial agreements to be legally bound. Domestic and social agreements are usually unenforceable. In common law jurisdictions there are three key elements to the creation of a contract. These are offer and acceptance, consideration, and an intention to create legal relations. In civil law systems the concept of consideration is not central. In addition, for some contracts formalities must be complied with under what is sometimes called a statute of frauds. One of the most famous cases on forming a contract is Carlill v. Carbolic Smoke Ball Company, decided in nineteenth century England. 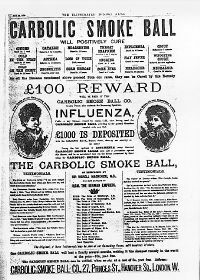 A medical firm advertised that its new wonder drug, the smokeball, would cure people's flu, and if it did not, buyers would receive £100. A significant number of people sued for their £100 when the product did not work. Fearing bankruptcy, Carbolic argued the advertisement was not to be taken as a serious, legally binding offer. It was merely an invitation to treat, or mere "puff," a gimmick; however, the court of appeal held that to a reasonable man, Carbolic had made a serious offer. People had given good "consideration" for it by going to the "distinct inconvenience" of using a faulty product. "Read the advertisement how you will, and twist it about as you will," said Lord Justice Lindley, "here is a distinct promise expressed in language which is perfectly unmistakable." Perhaps the most important feature of a contract is that one party makes an offer for a bargain that another accepts. This can be called a 'concurrence of wills' or a 'meeting of the minds' of two or more parties. There must be evidence that the parties had each from an objective perspective engaged in conduct manifesting their assent, and a contract will be formed when the parties have met such a requirement. An objective perspective means that it is only necessary that somebody gives the impression of offering or accepting contractual terms in the eyes of a reasonable person, not that they actually did want to contract. The case of Carlill v. Carbolic Smoke Ball Co. (above) is an example of a "unilateral contract," where an offer is made to the whole world and acceptance comes from particular people upon their fulfillment of the contractual terms or the condition precedent. In the U.S., the general rule is that in "case of doubt, an offer is interpreted as inviting the offeree to accept either by promising to perform what the offer requests or by rendering the performance, as the offeree chooses." Offer and acceptance does not always need to be expressed orally or in writing. An implied contract is one in which some of the terms are not expressed in words. This can take two forms. A contract which is implied in fact is one in which the circumstances imply that parties have reached an agreement even though they have not done so expressly. For example, by going to a doctor for a checkup, a patient agrees that he will pay a fair price for the service. If he refuses to pay after being examined, he has breached a contract implied in fact. A contract which is implied in law is also called a quasi-contract, because it is not in fact a contract; rather, it is a means for the courts to remedy situations in which one party would be unjustly enriched were he or she not required to compensate the other. Consideration must be sufficient, but need not be adequate. For instance, agreeing to buy a car for a penny may constitute a binding contract. In some situations, a "collateral contract" may exist, whereby the existence of one contract provides consideration for another. Critics say consideration can be so small as to make the requirement of any consideration meaningless. Consideration must not be from the past. For instance, in Eastwood v. Kenyon, the guardian of a young girl raised a loan to educate the girl and to improve her marriage prospects. After her marriage, her husband promised to pay off the loan. It was held that the guardian could not enforce the promise as taking out the loan to raise and educate the girl was past consideration, because it was completed before the husband promised to repay it. Consideration must move from the promisee. For instance, it is good consideration for person A to pay person C in return for services rendered by person B. If there are joint promisees, then consideration need only to move from one of the promisees. Civil law systems take the approach that an exchange of promises, or a concurrence of wills alone, rather than an exchange in valuable rights is the correct basis. So if A promised to give B a book, and B accepted A's offer without giving anything in return, B would have a legal right to the book and A could not change his mind about giving the book to B as a gift. However, in common law systems the concept of culpa in contrahendo, a form of 'estoppel,' is increasingly used to create obligations during pre-contractual negotiations. Estoppel is an "equitable doctrine" that provides for the creation of legal obligations if a party has given another an assurance and the other has relied on the assurance to his detriment. A number of commentators have suggested that consideration be abandoned, and estoppel be used to replace it as a basis for contracts. However, legislation, rather than judicial development, has been touted as the only way to remove this entrenched common law doctrine. Lord Justice Denning famously stated "The doctrine of consideration is too firmly fixed to be overthrown by a side-wind." There is a presumption for commercial agreements that parties intend to be legally bound. On the other hand, many kinds of domestic and social agreements are unenforceable on the basis of legal principles such as whether there is enough evidence for intentional actions between spouses. One early example is found in Balfour v. Balfour. Using contract-like terms, Mr. Balfour had agreed to give his wife £30 a month as maintenance while he was living in Ceylon (Sri Lanka). Once he left, they separated and Mr. Balfour stopped payments. Mrs. Balfour brought an action to enforce the payments. At the Court of Appeal, the Court held that there was no enforceable agreement as there was not enough evidence to suggest that they were intending to be legally bound by the promise. The case is often cited in conjunction with Merritt v. Merritt. Here the court distinguished the case from Balfour v. Balfour because Mr. and Mrs. Merritt, although married again, were estranged at the time the agreement was made. Therefore any agreement between them was made with the intention to create legal relations. Contrary to common wisdom, an informal exchange of promises can still be binding and legally as valid as a written contract. A spoken contract should be called an "oral contract," but it is often erroneously called a "verbal contract." Any contract that uses words, spoken or written, is a verbal contract. Thus, all oral contracts and written contracts are verbal contracts. This is in contrast to a "non-verbal, non-oral contract," also known as "a contract implied by the acts of the parties," which can be either implied in fact or implied in law. Most jurisdictions have formal requirements for certain kinds of contracts to be valid. Formalities are especially required for contracts involving large amounts of money, like real estate. For example, in the United States, a contract is unenforceable if it violates the statute of frauds. An example of the above is an oral contract for the sale of a motorcycle for US$5,000 (because in the U.S., any contract for the sale of goods over US$500 must be in writing to be enforceable). The point of the Statute of Frauds is to prevent false allegations of the existence of contracts that were never made, by requiring formal (written) evidence of the contract. Contracts that do not meet the requirements of Statute of Frauds legislation are unenforceable, but not void. However, a party unjustly enriched by an unenforceable contract may be subject to restitution for unjust enrichment. Statutes of Frauds are typically codified in state statutes covering specific types of contracts, such as contracts for the sale of real estate. In Australia, for contracts subject to legislation equivalent to the Statute of Frauds, there is no requirement for the entire contract to be in writing, although there must be a note or memorandum evidencing the contract, which may come into existence after the contract has been formed. The note or memorandum must be signed in some way, and a series of documents may be used in place of a single note or memorandum. It must contain all material terms of the contract, the subject matter and the parties to the contract. In England and Wales, the Statute of Frauds is still in force, but only for guarantees, which must be evidenced in writing, although the agreement may be made orally. Certain other kinds of contract must be in writing or they are void, for instance, for sale of land under s. 52, Law of Property Act 1925. If a contract is in a written form, and somebody signs the contract, then the person is bound by its terms regardless of whether they have read it or not., provided the document is contractual in nature. Furthermore, if a party wishes to use a document as the basis of a contract, reasonable notice of its terms must be given to the other party prior to their entry into the contract. This includes such things as tickets issued at parking stations. Courts may also look to external standards, which are either mentioned explicitly in the contract or implied by common practice in a certain field. In addition, the court may also imply a term; if price is excluded, the court may imply a reasonable price, with the exception of land, and second-hand goods, which are unique. If there are uncertain or incomplete clauses in the contract, and all options in resolving its true meaning have failed, it may be possible to sever and void just those affected clauses if the contract includes a severability clause. The test of whether a clause is severable is an objective test—whether a reasonable person would see the contract standing even without the clauses. The terms and conditions of a contract are its content. Once the so called essentialla negotii of a contract's formation are established, the question of what the parties of a contract have agreed to. Puff (sales talk): If no reasonable person hearing this statement would take it seriously, it is a puff, and no action in contract is available if the statement proves to be wrong. It may also be referred to as "puffery." Representation: A representation is a statement of fact made to induce another person to enter into a contract and which does induce them to enter into a contract, but it is one that the maker of the statement does not guarantee its truth. If the statement proves to be incorrect, it cannot be enforced, as it is not a term of the contract, but it may prove to be a misrepresentation, whereupon other remedies are available. Term: A term is similar to a representation, but the truth of the statement is guaranteed by the person who made the statement. The test is an objective test. Timing: If the contract was concluded soon after the statement was made, this is a strong indication that the statement induced the person to enter into the contract. The parol evidence rule limits what things can be taken into account when trying to interpret a contract. Reasonableness and equitableness: The implied term must be reasonable and equitable. Business efficacy: The implied term must be necessary for the business efficacy of the contract. For instance, if the term simply causes the contract to operate better, that does not fit this criterion. Obviousness: The term is so obvious that it goes without saying. Furthermore, there must be one and only one thing that would be implied by the parties. For example, in Codelfa Construction Pty Ltd v. State Rail Authority of New South Wales, a term regarding the inability of construction company to work three shifts a day could not be implied because it was unclear what form it would have taken. Clear expression: The term must be capable of clear expression. No specific technical knowledge should be required. Consistency: The implied term may not contradict an express term. Necessity: The term must be necessary to ensure reasonable or effective operation of a contract of the nature before the court. Consistency: The implied term may not contradict an express term (same as for formal contracts). Clear expression: The term must be capable of clear expression (same as for formal contracts). Obvious: McHugh and Gummow JJ have stated that it must also be obvious. These are terms that have been implied into standardised relationships. The other difference between this and terms implied in fact is that the test is one of necessity; a necessary term is one where the contract is rendered worthless or nugatory if it is without it. You are generally bound by the custom of the industry that you are in. To imply a term due to custom or trade, you must prove the existence of the custom, which must be notorious, certain, legal and reasonable. If two parties have regularly conducted business on certain terms, it may be reasonable to presume that in future dealings where there is no contract, the parties wish to incorporate the terms of the previous contracts. However, if a party wishes to incorporate terms by course of dealing, the original document must have been contractual in nature, and delivery receipts may not fit this description. In Australia, there is a further requirement that the document was procured after formation. It is common for lengthy negotiations to be written into a heads of agreement document that includes a clause to the effect that the rest of the agreement is to be negotiated. Although these cases may appear to fall into the category of agreement to agree, courts nowadays (at least in Australia) will imply an obligation to negotiate in good faith provided that certain conditions are satisfied. The test of whether one has acted in good faith is a subjective one; the cases suggest honesty, and possibly also reasonableness. Once again, there is an element of good faith involved. This may also refer to contingent conditions, which come under two categories: condition precedent and condition subsequent. Conditions precedent are conditions that have to be complied with before performance of a contract. With conditions subsequent, parties have to perform until the condition is not met. Failure of a condition does not void the contract, it is just regarded as voidable. The rules by which many contracts are governed are provided in specialized statutes that deal with particular subjects. Most countries, for example, have statutes which deal directly with sale of goods, lease transactions, and trade practices. For example, most American states have adopted Article 2 of the Uniform Commercial Code, which regulates contracts for the sale of goods. There can be three different ways in which contracts can be set aside. A contract may be deemed "void," "voidable," or "unenforceable." Voidness implies that a contract never came into existence. Voidability implies that one or both parties may declare a contract ineffective at their wish. Unenforceability implies that neither party may have recourse to a court for a remedy. Recission is a term which means to take a contract back. A contract may be voided, voidable or unenforceable because of misrepresentation, a mistake, duress or undue influence, incapacity, or illegality. According to Gordon v. Selico, it is possible to make a misrepresentation either by words or by conduct, although not everything said or done is capable of constituting a misrepresentation. Generally, statements of opinion or intention are not statements of fact in the context of misrepresentation. If one party claims specialist knowledge on the topic discussed, then it is more likely for the courts to hold a statement of opinion by that party as a statement of fact. A mistake is an incorrect understanding by one or more parties to a contract and may be used as grounds to invalidate the agreement. Common law has identified three different types of mistake in contract: unilateral mistake, mutual mistake, and common mistake. A unilateral mistake is where only one party to a contract is mistaken as to the terms or subject-matter. The courts will uphold such a contract unless it was determined that the non-mistaken party was aware of the mistake and tried to take advantage of the mistake. It is also possible for a contract to be void if there was a mistake in the identity of the contracting party. An example is in Lewis v Avery, where Lord Denning MR held that the contract can only be avoided if the plaintiff can show, that at the time of agreement, the plaintiff believed the other party's identity was of vital importance. A mere mistaken belief as to the credibility of the other party is not sufficient. A mutual mistake is when both parties of a contract are mistaken as to the terms. Each believes they are contracting to something different. The court usually tries to uphold such a mistake if a reasonable interpretation of the terms can be found. Although a contract based on a mutual mistake in judgment does not cause the contract to be voidable by the party that is adversely affected. See Raffles v. Wichelhaus. A common mistake is where both parties hold the same mistaken belief of the facts. This is demonstrated in the case of Bell v. Lever Brothers Ltd., which established that common mistake can only void a contract if the mistake of the subject-matter was sufficiently fundamental to render its identity different from what was contracted, making the performance of the contract impossible. Duress has been defined as a "threat of harm made to compel a person to do something against his or her will or judgment, such as a wrongful threat made by one person to compel a manifestation of seeming assent by another person to a transaction without real volition." An example is in Barton v. Armstrong, a decision of the Privy Council. Armstrong threatened to kill Barton if he did not sign a contract, so the court set the contract aside. An innocent party wishing to set aside a contract for duress to the person need only to prove that the threat was made and that it was a reason for entry into the contract; the onus of proof then shifts to the other party to prove that the threat had no effect in causing the party to enter into the contract. There can also be duress to goods and sometimes, the concept of "economic duress" is used to vitiate contracts. Undue influence is an equitable doctrine that involves one person taking advantage of a position of power over another person. The law presumes that in certain classes of special relationship, such as between parent and child, or solicitor and client, there will be a special risk of one party unduly influencing their conduct and motives for contracting. As an equitable doctrine, the court has the discretion to vitiate such a contract. When no special relationship exists, the general rule is whether there was a relationship of such trust and confidence that it should give rise to such a presumption. Sometimes the capacity of either natural or artificial persons to either enforce contracts, or have contracts enforced against them is restricted. For instance, very small children may not be held to bargains they have made, or errant directors may be prevented from contracting for their company, because they have acted ultra vires (beyond their power). Another example might be people who are mentally incapacitated, either by disability or drunkenness. When the law limits or bars a person from engaging in specified activities, any agreements or contracts to do so are either voidable or void for incapacity. The law on capacity can serve either a protective function or can be a way of restraining people who act as agents for others. A contract is void if it is based on an illegal purpose or contrary to public policy. One example, from Canada is Royal Bank of Canada v. Newell. A woman forged her husband's signature on 40 checks, totaling over $58,000. To protect her from prosecution, her husband signed a letter of intent prepared by the bank in which he agreed to assume "all liability and responsibility" for the forged checks. However, the agreement was unenforceable, and struck down by the courts, because of its essential goal, which was to "stifle a criminal prosecution." Because of the contract's illegality, and as a result voided status, the bank was forced to return the payments made by the husband. In the U.S., one unusual type of unenforceable contract is a personal employment contract to work as a spy or secret agent. This is because the very secrecy of the contract is a condition of the contract (in order to maintain plausible deniability). If the spy subsequently sues the government on the contract over issues like salary or benefits, then the spy has breached the contract by revealing its existence. It is thus unenforceable on that ground, as well as the public policy of maintaining national security (since a disgruntled agent might try to reveal all the government's secrets during his/her lawsuit). A breach of contract is failure to perform as stated in the contract. There are many ways to remedy a breached contract assuming it has not been waived. Typically, the remedy for breach of contract is an award of money damages. When dealing with unique subject matter, specific performance may be ordered. As for many governments, it was not possible to sue the Crown in the U.K. for breach of contract before 1948. However, it was appreciated that contractors might be reluctant to deal on such a basis and claims were entertained under a petition of right that needed to be endorsed by the Home Secretary and Attorney-General. S.1 Crown Proceedings Act 1947 opened the Crown to ordinary contractual claims through the courts as for any other person. There are three different types of damages. Compensatory damages which are given to the party which was detrimented by the breach of contract. With compensatory damages, there are two kinds of branches, consequential damages and direct damages. Nominal damages which include minimal dollar amounts (often sought to obtain a legal record of who was at fault). Punitive damages which are used to punish the party at fault. These are not usually given regarding contracts but possible in a fraudulent situation. Whenever a contract requires completing something and a person says that it will not be completed before they begin the project, this is referred to anticipatory breach. When it is either not possible or desirable to award damages measured in that way, a court may award money damages designed to restore the injured party to the economic position that he or she had occupied at the time the contract was entered (known as the "reliance measure"), or designed to prevent the breaching party from being unjustly enriched ("restitution"). There may be circumstances in which it would be unjust to permit the defaulting party simply to buy out the injured party with damages. For example where an art collector purchases a rare painting and the vendor discovers its true value and refuses to deliver the painting at the original price charged. Thus there was a breach of the contract and in this situation, the collector's damages are for the value of a rare painting and not the price that was originally charged by the seller. The court may make an order of what is called "specific performance," requiring that the contract be performed. In some circumstances a court will order a party to perform his or her promise (an order of "specific performance") or issue an order, known as an "injunction," that a party refrain from doing something that would breach the contract. A specific performance is obtainable for the breach of a contract to sell land or real estate on such grounds that the property has a unique value. Both an order for specific performance and an injunction are discretionary remedies, originating for the most part in equity. Neither is available as of right and in most jurisdictions and most circumstances a court will not normally order specific performance. A contract for the sale of real property is a notable exception. In most jurisdictions it is enforceable by specific performance. However, even in this case the defenses to an action in equity (such as laches, the bona fide purchaser rule, or unclean hands) may act as a bar to specific performance. In the United States, in order to obtain damages for breach of contract or to obtain specific performance, the injured party may file a civil (non-criminal) lawsuit, usually in a state court, or petition a private arbitrator to decide the contract issues presented. Many contracts provide that all contract disputes must be arbitrated by the parties to the contract, rather than litigated in courts. By law, some contracts, including most securities brokerage contracts, must be arbitrated; other contracts are referred by courts as a matter of local law or policy. Arbitrated judgments are generally enforced and appealed in the same manner as ordinary court judgments; a majority of states have adopted the Uniform Arbitration Act to facilitate the enforcement of arbitrated judgments. The doctrine of privity of contract means that only those involved in striking a bargain would have standing to enforce it. In general this is still the case, only parties to a contract may sue for the breach of a contract, although in recent years the rule of privity has eroded somewhat and third party beneficiaries have been allowed to recover damages for breaches of contracts they were not party to. A recent example is in England, where the Contract (Rights of Third Parties) Act 1999 was introduced. The law of obligations has traditionally been divided into contractual obligations, which are voluntarily undertaken and owed to a specific person or persons, and obligations in tort which are based on the wrongful infliction of harm to certain protected interests, primarily imposed by the law, and typically owed to a wider class of persons. Recently it has been accepted that there is a third category, restitutionary obligations, based on the unjust enrichment of the defendant at the plaintiff’s expense. Contractual liability, reflecting the constitutive function of contract, is generally for failing to make things better (by not rendering the expected performance), liability in tort is generally for action (as opposed to omission) making things worse, and liability in restitution is for unjustly taking or retaining the benefit of the plaintiff’s money or work. Contract law is the body of legal theory that addresses normative and conceptual questions in contract theory. One of the most important questions asked in contract theory is why contracts are enforced. One prominent answer to this question focuses on the economic benefits of enforcing bargains. Another approach, associated with Charles Fried and developed in his book, Contract as Promise, maintains that the purpose of contract law is to enforce promises. Other approaches to contract theory are found in the writings of legal realists and critical legal studies theorists. ↑ Hans Wehberg, Pacta Sunt Servanda, The American Journal of International Law, 53 (4) (Oct., 1959): 775. ↑ s. 52, Law of Property Act 1900. ↑ Lord Steyn, Contract Law: Fulfilling the Reasonable Expectations of Honest Men (1997) 113 LQR 433; c.f. § 133 BGB in Germany, where "the actual will of the contracting party, not the literal sense of words, is to be determined"
↑ Chappell & Co Ltd v Nestle Co Ltd  2 All ER 701. ↑ Austotel v. Franklins (1989) 16 NSWLR 582. ↑ P.S. Atiyah, Consideration: A Restatement, in Essays on Contract (Oxford University Press, 1986). ↑ Central London Property Trust Ltd. v. High Trees House Ltd.  KB 130. ↑ Balfour v. Balfour  2 KB 571. ↑ L'Estrange v. F Graucob Ltd  2 KB 394. ↑ Curtis v. Chemical Cleaning and Dyeing Co  1 KB 805. ↑ Balmain New Ferry Company Ltd v. Robertson (1906) 4 CLR 379. ↑ Hillas v. Arcos Ltd (1932) 147 LT 503. ↑ Whitlock v. Brew (1968) 118 CLR 445. ↑ Oscar Chess Ltd v. Williams  1 WLR 370. ↑ Liverpool City Council v. Irwin  2 WLR 562. ↑ Con-stan Industries of Australia Pty Ltd v. Norwich Winterthur Insurance (Australia) Ltd (1986) 160 CLR 226. ↑ Frigaliment Importing Co., Ltd., v. B.N.S. International Sales Corp., 190 F. Supp. 116 (S.D.N.Y. 1960) (plaintiff failed to prove what he meant by "chicken") and U.C.C. § 1-205. ↑ Coal Cliff Collieries Pty Ltd v. Sijehama Pty Ltd (1991) 24 NSWLR 1. ↑ Gordon v. Selico (1986) 18 HLR 219. ↑ Bisset v Wilkinson and others  AC 177. ↑ Esso Petroleum Co Ltd v Mardon  2 Lloyd's Rep. 305. ↑ Smith v. Hughes . ↑ Lewis v Avery  3 All ER 907. ↑ Raffles v. Wichelhaus (1864) 2 Hurl. & C. 906. ↑ Bell v Lever Brothers Ltd.  ALL E.R. Rep. 1,  A.C. 161. ↑ Black's Law Dictionary (8th ed. 2004). ↑ Johnson v. Buttress (1936) 56 CLR 113. ↑ Royal Bank of Canada v. Newell 147 D.L.R (4th) 268 (N.C.S.A.). Atiyah, P.S. The Rise and Fall of Freedom of Contract. Clarendon Press, 1979. ISBN 0198253427. Barnett, Randy, E. Contracts. Aspen Publishers, 2003. ISBN 0735565352. Fried, Charles. Contract as Promise: A Theory of Contractual Obligation. Cambridge, MA: Harvard University Press, 1981. ISBN 0674169255. McKendrick, Ewan. Contract Law—Text, Cases and Materials. Oxford University Press, 2005. ISBN 0199274800. This page was last modified on 9 March 2018, at 21:31.